A dislocated shoulder is a traumatic and painful injury. Seek medical attention immediately if you think you may have a dislocated shoulder. Dislocated shoulders are usually caused by a fall onto an outstretched arm, twisting or impact to the shoulder. Sudden severe pain will be felt at the time of injury along with rapid swelling and bruising which develops later. The patient may feel the shoulder pops out of the joint and the injured side will often look different or possibly lower than the uninjured side. The patient will be in severe pain and usually hold the arm close to their body and resist moving or turning it outwards. If there is any nerve or blood vessel damage there may also be pins and needles, numbness or discoloration through the arm to the hand. If a dislocated shoulder is suspected then seek immediate medical attention. 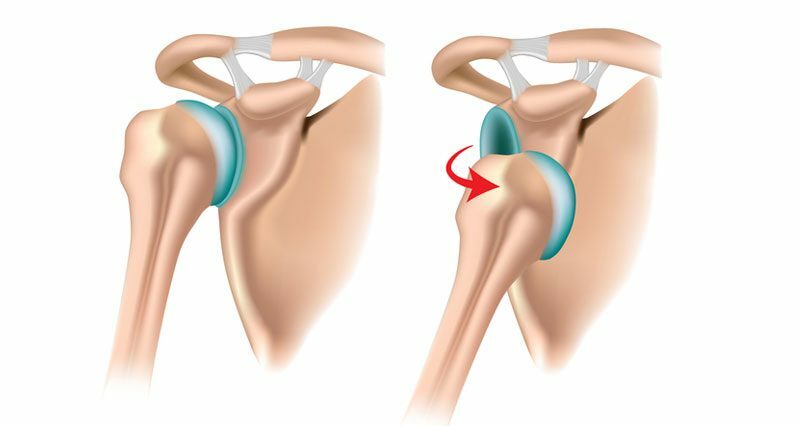 DO NOT attempt to put the joint back into place (called reduction) if you are not qualified to do so as long term damage to the shoulder can be caused. Shoulder dislocations occur when the head of the humerus bone pops out of the shoulder joint. They are usually either posterior where the head of the upper arm bone or humerus dislocates out of the back of the joint or more commonly anterior where it pops out forwards. In most cases, the top of the upper arm bone is forced forwards when the arm is held out to the side and turned outwards or to use technical language, externally rotated and abducted. 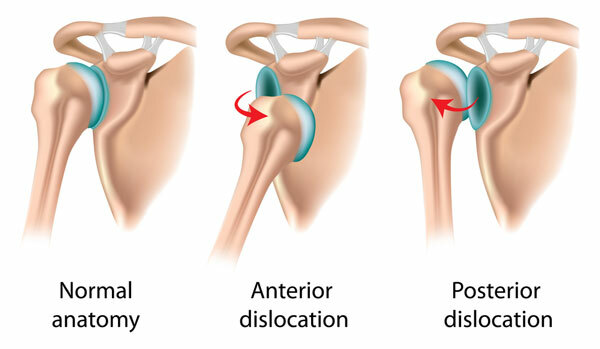 This is known as an anterior shoulder dislocation and happens in approximately 95% of all injuries. Posterior dislocations account for around 3% of shoulder dislocations and can occur during epileptic seizures or when falling onto an outstretched hand. The shoulder joint is particularly prone to injury due to the large range of movement available, which sacrifices stability. Most shoulder dislocations also cause tears to the glenoid labrum which is a ring of cartilage which acts as a cup in which the humerus bone rests. There is likely to be damage to the surrounding ligaments, tendons, nerves, blood vessels and fractures to other bones. Recurring injuries can be common which is why it is especially important that sufficient shoulder rehabilitation is done. Immediate treatment for a dislocated shoulder has two stages. Firstly to protect the shoulder joint and prevent further damage and secondly to seek medical attention as soon as possible. Stop play immediately and seek medical attention. It is not likely you will have a choice in this as a dislocated shoulder is very painful. A doctor will need to confirm the shoulder is dislocated and put it back into its socket (known as reduction). Do not attempt to pop the shoulder back in yourself. Serious damage can occur to nerves and other blood vessels if it is done incorrectly. Apply ice or cold therapy immediately. Ice can be applied for 15 minutes every hour to help with the pain and swelling. Specialist cold therapy shoulder wraps are particularly good as they apply both cold therapy and compression at the same time. If a reduction is not possible immediately, a sling may be applied to take the weight off the arm. The reduction is the medical term used to describe popping the dislocated bone back in the joint. The sooner the shoulder is reduced the easier it will be to reduce it. This can be done without surgery, called a closed reduction or surgically known as open reduction. The decision of whether to surgically reduce the shoulder may depend on associated injuries, fractures and damage to the shoulder joint. In particular, evidence also suggests that young, active adults between the ages of 15 and 25 would benefit from surgical reduction for a first time anterior dislocation. The recurrence rate and quality of life outcomes appear to be better than for nonsurgical reduction. Patients aged 25 to 40 may be recommended a period of conservative treatment first as recurrence rate is lower for older patients. It should NEVER be attempted by someone who is not appropriately trained as serious damage to nerves and other structures could occur, and should always be followed up with a post-reduction X-Ray to check for any possible complications. Treatment following a closed reduction is often referred to as conservative treatment (non-surgical), and usually involves a period of rest in a sling or similar. Some surgeons will advocate immobilizing in 30 degrees of external rotation although traditionally the shoulder has been immobilized in medial rotation. The evidence does not appear to be clear either way. Immobilization is followed by a shoulder rehabilitation program prescribed by a physiotherapist. The purpose of immobilizing the arm for a period of time is to allow the structures which may have been injured to have adequate time to heal. Traditionally the shoulder is immobilized in a sling in medial rotation with the arm across the body until the tissues have healed. The shoulder will need extensive rehabilitation to regain mobility and strength. Following a reduction, you will usually be advised to rest and immobilize the shoulder in a sling for 5-7 days, longer if there are fractures or severe soft tissue damage. You may be prescribed NSAIDs such as ibuprofen to ease pain and inflammation. Following reduction, the shoulder should be immobilized in a sling for at least a week depending on the severity of the injury. Performing wrist and hand exercises such as moving each finger through its range of motion and clenching the fist will prevent stiffness and keep the blood flowing to the area. Continue applying cold therapy regularly to reduce pain and swelling. A doctor may prescribe anti-inflammatory medication to reduce pain and inflammation. 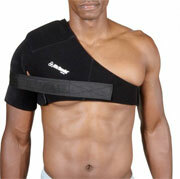 Taping the shoulder joint may also help give extra support as might a heavy duty shoulder support. When pain allows mobility exercises can begin, usually starting with simple pendulum exercises. Avoid the combined movements of abduction (taking the arm out to the side) and external rotation (turning the shoulder outwards) as this is often the position the injury occurred and is likely to happen again. Only exercise if the shoulder is pain-free and continue to wear a sling when not performing exercises if you feel it necessary. Apply ice after exercise if swelling occurs. The aim here is to begin to restore strength the muscles and achieve full range of motion in the shoulder joint. Begin isometric or static strengthening exercises providing there is no pain. Begin to move the shoulder into abduction and external rotation if comfortable to do so, but do not perform strengthening exercises in this position. Continue with mobility exercises and try to achieve a full pain-free range of movement. One of the most important exercises is medial rotation in the internal range of movement. It is vital that strength is built up in this range to avoid future shoulder dislocations. Avoid wearing a sling now if possible. In addition to rotator cuff exercises, it is important to do regular scapular stabilization exercises. There are literally dozens of shoulder rehabilitation exercises. See our shoulder exercises section for a full list of early, mid and late stage shoulder rehab exercises. Duration weeks 6 to 10 aim to achieve strength equal to the uninjured side and maintain mobility. Progress strengthening to resisted exercises if pain-free with external rotation strengthening in the abducted position if comfortable. Continue with mobility exercises to maintain a full range of motion Introduce proprioception exercises. Aim to return to normal sports training and competition. Increase resistance used for strengthening, progress to dumbbells and body weight exercises. Start functional activities such as throwing (start underarm and progress) and catching. Begin a gradual return to sport, starting with training drills, non-contact and slowly increase the demand on the shoulder. After the period of initial immobilization, exercises to gradually increase your range of pain-free movement are done. A dislocated shoulder rehabilitation program will include mobility exercises to regain normal range of motion, isometric strengthening exercises, dynamic strengthening, proprioception exercises and functional or sports specific rehabilitation exercises in the later stages. Strengthening the rotator cuff muscles which support the shoulder joint should be done to prevent recurrences. In particular, medial rotation exercises in the inner range are important. Exercises using resistance band are excellent for this in the early stages. Functional exercises involve balance board training and plyometric type exercises with medicine balls. Read more on exercises for a dislocated shoulder. 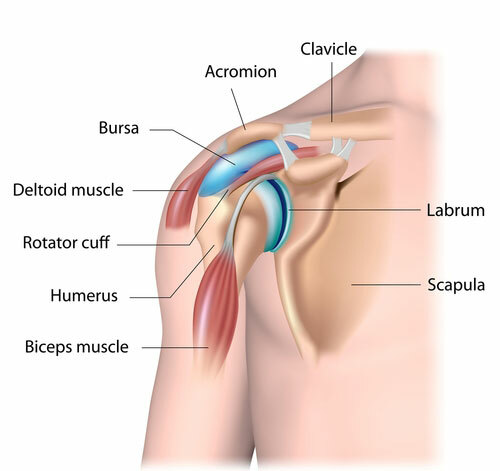 Some cases may require surgery if the shoulder is regularly dislocating, or if any of the bones have been fractured. Surgery is also sometimes necessary following a dislocated shoulder if there has been extensive damage to muscles, tendons, nerves, blood vessels or the labrum. 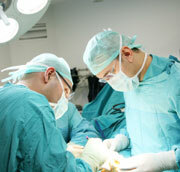 Surgery is usually performed as soon as possible after the injury. In cases of recurrent shoulder dislocations, surgery may be offered in an attempt to stabilize the joint. There are a number of procedures which can be performed. The decision over which procedure to use depends largely on the patient’s lifestyle and activity. Some procedures result in reduced shoulder external rotation and so are not suitable for athletes involved in throwing or racket sports as this would affect performance. Unfortunately, recurrent dislocations are frequent. It is very common following one traumatic dislocation of the shoulder to have this happen again, particularly with a closed reduction. In young, active people the option for a surgical investigation via arthroscopy with any damage being repaired at the same time may be offered, as may tightening of very lax ligaments and muscles to prevent recurrent dislocation. This option would always be followed by a rehabilitation protocol to ensure you get the most out of the procedure, and often attract quite low re-dislocation rates. This may, however, mean abstaining from sport for some time – perhaps a whole season depending on the nature of your sport. If for whatever reason shoulder surgery is not an option there are a wide range of treatments available to the physiotherapist and sports doctor to improve your strength and positional awareness of the shoulder, including exercise plans, electrotherapy (to help stimulate muscles which should be working to support the shoulder), hydrotherapy, and a range of other modalities.